Closed. Notice in window - "please bear with us while we refurbish the pub". Our traditional Christmas walk goes from Lower Hardres to the Duck and back. This is a very friendly pub. It was busy with lots of people eating and drinking but the land lady went out of her way to find us a seat. Great pub. Tonbridge - Rustic 4.00 On gravity. Really good dark malty bitter. Tonbridge - Traditional 3.60 Gravity fed - Good malt/hop balance - session ale. 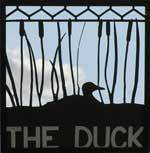 I watched On Her Majesty's Secret Service yesterday and it put me in mind of The Duck Inn with its Fleming connection. We arived about 12:30 and the friendly owners engineered us a seat by the fire. The rest of the pub started filling up with diners rapidly. After a successful visit last week I thought I would take another look. Very food biased but with good ale on gravity who cares? Adnams - Ghost Ship 4.50 Very nice, not to sure to start but it quickly grew on me. Unmistakeably Adnams, yeasty, peppery with a long finish. Gravity serving suits this beer. Noticed that Andrew had been here and found some real ale so decided to take a look. Whitstable - Pearl of Kent 4.50 OK, nothing spectacular, good hops. Old Dairy - Blue Top 4.80 Nice enough,on gravity, a bit tired perhaps. We walked from Lower Hardres to Pett Bottom. Lots of nice silver birches to be seen and ploughed fields too. Nice pub. Nice real fire. Nice to see 2 Kent micro's on gravity. A beer festival on so decided to take a look, much better selection than previous festivals. Shame about the cold windy evening.Strange that a pub that offers so much at a beer festival only has Masterbrew on the bar. Weird. Hopdaemon - Incubus 4.00 Old reliable, one of my favourite beers, rich and complex. Ramsgate Brewery (Gadds') - She Sells Sea Shells 4.70 Really nice, good hops and citrus, fresh and refreshing. Adnams - Topaz Gold 4.00 fresh and hoppy, good citrus notes. Hopdaemon - Green Daemon 5.00 Still not sure about this beer, but this was very nice. Decided to go home the cross country way, the sun was shining and the pub looked nice so we stopped. A nice pub in the countryside, one Irish beer on, one Scandinavian, one Belgian, one German and one English real ale, sad really. Shepherd Neame - Master Brew Bitter 3.70 Not really sheps fan but this was in super condition, malt, hops and really fresh. I'd read in the paper that they were having a beer festival so we went to see what it was like. Man it was heaving. People were camping in the field opposite where there was also a series of inflatable castles. A band were playing in the garden which also housed the beer tent and about 100 people enjoying the atmosphere. The band were fronted by an old chap in a sailor's hat and were playing an odd bunch of Noel Coward like stuff. They were very entertaining. 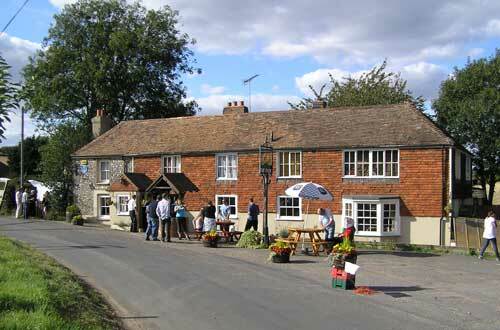 The pub is found in Pett Bottom, Kent, CT4 5PB. Once Ian Fleming's local pub. The interior is split into a long front bar with a more restauranty room at the end. We have visited this pub 12 times, seen 39 different beers and tried 15 of them.